What is happening over the festival…. The Jersey Surf Film Festival is in it’s 3rd year and we are broadening the focus from surf culture to the ocean and the wider environment. We will be returning to The Far Flung Motel venue at the Jersey Scout Centre on 12th, 13th and 14th July to build a unique weekend long camp for far out thinkers who want to engage with their inner wilderness and the learn more about environmental issues through films, arts workshops, music, fireside storytelling, delicious and sustainable food from the land and sea, stargazing yoga, surf school, foraging walks, talks and much more. We will include space for 120 campers mainly families who want a “staycation” at our surf side retreat, so that festival goers can truly immerse themselves in the natural environment of the camp. The Far Flung Motel is situated in the heart of the Jersey’s National Park and on the edge of one of the Islands most stunning stretches of beach with a consistent surf break. The camp opens Friday night at 6pm. 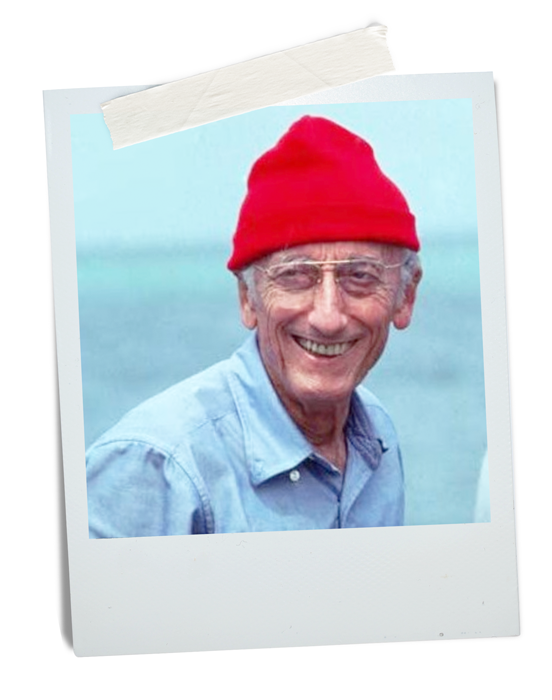 A film about legendary explorer, conservationist and photographer Jaques Cousteau, with an introduction by Jersey Marine Conservation Society and a selection short films about benefits of Sea swimming shall play beforehand - Swimming: For Mind, Body & Soul. Attendees will be encouraged to dress up “Jacques Cousteau” style for the feature event. This will be followed by a campfire side storytelling and a little acoustic music based on Myths of the Sea with Naomi West. Campers can enjoy a spot of stargazing Yoga Nidra to send them off to sleep. Festival directors Rebecca Coley and Natasha Dettman have pulled together a unique, arts driven programme which they hope will rekindle a love and respect for the ocean and coastal environment whilst making a conscious effort to protect and leave the site in a better state than when they arrived. Yoga - A Chi Gong session and meditation. Artland - All natural sculpture gallery build with the Jersey Youth Service, and families camping onsite. This will be lead by Natasha Dettman, artists, youth service workers and ecologists. Using willow structures to create sculptures and fuel the children’s imagination and get them to interact with nature. Childrens Art Workshops - There are also arts workshops for younger children with the Insect Ball; leaf insect making workshop, Ian and Ruth Rolls’ Cafe Art Cart and an Up-cycle Re-cycle, Trash Fashion workshop using repurposing reusable materials with textile artists Margarida Lourenco and Bianca Padidar. We will also be taking the art to the beach with sand drawing and the creation of a meditation labyrinth. SCOOP - The organic, sustainable food cooperative shop will be onsite hosting a farmers market with locally sourced fresh produce. Faraging with Kaz - Kaz Padidar will be leading a group on a foraging walk sponsored by JICAS to explore the diversity around the local area ending with some fireside cooking and Elderflower Champagne. Surfing & Sea Swimming - We hope to encourage our guests of all ages to get in to the sea and are hosting Surf School and wild swimming with qualified instructors. Wild swimming leaders will also be giving talks about their passion for this activity and how it can help improve all manner of physical and mental conditions. Inspiring Talks - We will be hosting a programme of inspiring talks throughout the day in our Club House room. These talks are focussed on environmental issues and looking at inspiring ways Jersey can respond to the challenges we face on a local and global scale. The Lunchtime Board Meetings - Hosted by Jason Horton, Arlene Maltman, Andrew Ozouf of Freevibes magazine and Dave Ferguson. Starting at 1pm we invite you to join the discussion on everything from Surfing becoming an Olympic sport, How surfers can be activists for positive change, Board Stories by Jason Horton- series on the never ending debates on board shapes and sizes and who rides what. Photography Workshop - Robbie Dark will leading an Ocean photography workshop at 4pm. Onsite record shop - dedicated to a love of vinyl records will be easing campers towards the afternoon with a DJ Workshop form Carrie Cooper at 3pm and then picking up the beat as the sun sets with tunes from Brazilian Wax. Look out for a drumming workshop and the odd impromptu musical performance from our host of artists and musicians staying onsite. Although we have many things planned we would like to think people can feel comfortable enough to explore their creativity in a relaxed informal way when the mood takes them. Mosaics - Local Indie/electronica quartet The Mozaics will be headlining Saturday night. Since forming in 2015, Mozaics have enjoyed dozens of BBC Introducing plays, with support from BBC Radio’s 1 Huw Stephens, Amazing Radio and Radio X from their self released singles. Midnight Yoga - We round up the night with Yoga Nidra under the stars and guided sleep meditation sessions in our cosy club house.